Google wants to help users spend less time on YouTube. This week, users will be able to set up reminders telling them to take a break, and the app will get options to reduce the number of notifications they get during the day. Google CEO Sundar Pichai is taking on phone addiction – starting with YouTube. 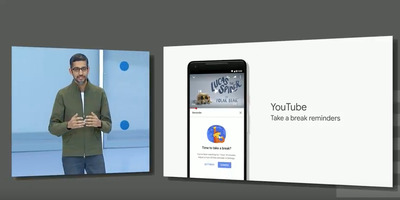 At Google I/O, the company’s annual development conference, Pichai announced that users will be able to set up notifications reminding them to take a break after if they watch too much YouTube. Users can also set up YouTube notifications to be sent in a daily digest, instead of as they happen, so you look at your phone less. The aim of these features is to get people to spend less time on YouTube. These new options stand in contrast to long-running YouTube features, such as suggested videos and autoplay, that are built to make people spend as much time on the platform as possible. “People are anxious to stay up to date on all the information out there. They have FOMO, fear of missing out. We’ve been talking to people and they introduced us to JOMO, the actual joy of missing out. So we really think we can help users with digital well being,” Pichai said on stage before announcing the new features. The features will be rolled out this week. Phone addiction has become an issue this year after a group of shareholders called on Apple to address it. Google, which makes the most popular operating system in the world, has so far avoided the same level of scrutiny – but with these features, it appears the company is looking to tackle the issue.